Signia NX available with Rechargeable Battery. Simply charge the hearing aid while you sleep and do away with the hassle of changing batteries again. It takes 3 hours to fully charge hearing aids, which provides up to 19 hours of use. The Signa Nx hearing aids with OVP has proven to improved spontaneous acceptance of own voice by 75% of dissatisfied hearing aid wearers *. The sound of own voice is the most common issues for new hearing aid wearers. For most hearing aid wearers, the more their hearing aid processed voice differs from their own perception of their own voice, the less comfortable and accepting the experience will be. To achieve clear speech understanding, hearing aids need to provide appropriate volume and audibility. However, the sufficient amplification often leads to reduced acceptance of own voice. In an attempt to solve the problem, the audiologist reduces the amplification to ensure own voice sounds more natural. This, of course, reduces the audibility of speech. 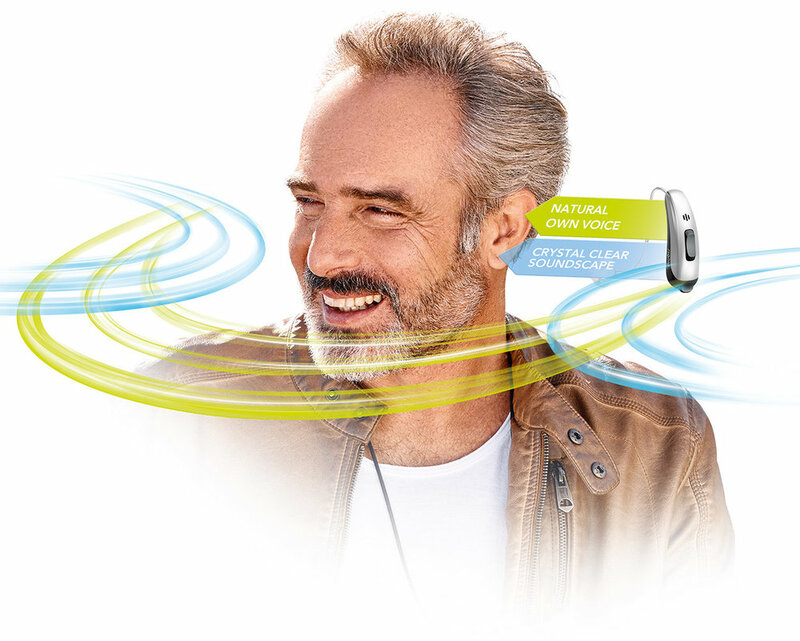 The Signia NX hearing aids uses OVP which detects hearing aid wearer’s own voice and process separately from external sounds. This means when the wearer is speaking, the hearing aid detects and apply dedicated setting different from when only external sounds are present, providing comfortable own voice and best audibility of external speech. Signia Nx uses 2.4 GHz Bluetooth to connect to your iPhone so you can listen to phone calls and music directly through the hearing aids without any additional accessories. Widex have taken their hearing instruments to beyond the ordinary by providing connectivity to iPhones. Wearers can now hear phone conversations through their hearing aids, can hear music from their iPhones through the devices and can use their iPhones to control their hearing aids. The new range of instruments is called the Widex Beyond and the new feature is called Made for iPhone (MFi). Many of the features in the special app can also be used with android phones. The Widex Beyond personalised app allows wearers to use intuitive commands on their phone’s screen to adjust the volume on each hearing aid individually, choose speech and comfort settings, and set microphone directionality. Wearers can also use the app for troubleshooting and can even use their iPhone to find their hearing aids if they are lost. Widex says its Beyond devices also offer better power consumption than other MFi-streaming hearing aids, which is a huge plus because with some MFi-linked devices, batteries may be reduced - depending on use. The Widex Beyond hearing instruments have an innovative integrated signal processing chip-set design with full independent channel separation, minimal-delay filters, and four A/D converters, meaning clear sound for users. Contact us to arrange obligation-free trial.